Description A10 is the basic and entry-level weight-based surface and interfacial tensiometer with portable control terminal, incuding 3 method:classical Wihelmy Plate Method (Slide Wihelmy Plate Method), Modified Wihelmy Plate Method and DuNoüy Ring Method. Measurement of surface tension (ST) / interface tension (IFT) , analysis of equilibrium and dynamic contact angle (CA / DCA) of solid material, contact angle of powder and fiber, as well as measurement of critical micelle concentration (CMC) of surfactant and more are all characterizations of interface chemistry. Modularity designed series A10 are equipped with micro-analytical balance, high-precision vertical travel positioning stage controlled by stepper motor, and digital semiconductor temperature sensor. The instrument advantages in such merits as simple operation, high accuracy, complete function and excellent quality. It has powerful data management and covers three different measurement methods, which enable it to be applied extensively in measurement of dynamic / static surface tension (ST) and interface tension (IFT). International design, global sourcing and professional service provide you comprehensive and professional solution in interface chemistry measurement. The latest upgraded model A101S embeds professional customized portable control terminal, with which you can control your interface chemistry analytical process more conveniently. All data can be copied into your U-disk and printed out. Unexpected functions are all designed for you. - Electromagnetic force balance sensor technology, expertise in micro-weighing analysis. - Better temperature drifting correction, zero tracking technology. - Data processing with more reliable values. - Upgradeable software, customized to meet your special test requirements. - Digital temperature sensor made of semiconductor with temperature resolution of 0.01℃ and absolute temperature accuracy of down to 0.0625℃. - More methods available for you to make a comprehensive solution. - USA KINO exclusively provides 3 methods, including classical Wihelmy plate method (slide Wihelmy plate method), modified Wihelmy plate method and DuNoüy ring method. 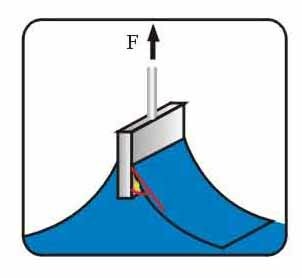 It can be used for measurement of dynamic & static surface / interface tension, especially for viscosity sample, which enriches measurement technologies of interface chemistry. Series A10 are equipped with both weighing sensor calibration and self-calibration function for sensing interface (Wilhelmy plate and DuNoüy ring), which is much better than other manufacturers’. It can enable you to control reliability of measured value more effectively. - Software manages all live data that balance acquired. All data can be query and modified as well as exported to Excel. 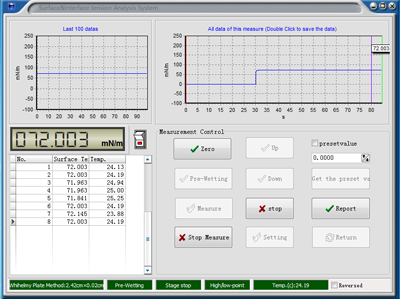 - Real-time display of data graph, with observation of interface tension changes. -Real-time data storage and display, historical data searching, and eigenvalue modification are all available with CAST®1.0. -CAST®1.0 saves all measured data of dynamic value automatically and exports them into Excel.